only butter, sugar and spice. or melt to mush in a glass of milk. and sit peacefully in the warm glow. Such a gift ?!!! Thank you. The vivid inner scene your gingerbread house evoked in me is one of sitting by a fire with my Beloved, in the only safe house I now know, one of Pure Spirit and Love within me. It has all the sweetness and novelty of your festive holiday house. Your poetic suggestions in thought are food for my soul, dear Lesley. Thank you for sharing the beauty which is you. Beautifully expressed, Monica. Truly the inner mansion is the only safe place, and we are fortunate to come to know this. Thank you for your insight and for the lovely card you sent. I’m ever grateful. Beautiful words Leslie. So true and powerful. Home is the soul. Nothing can crumble it. I love the spiritual “gingerbread house” as well as the one I am assuming you made! Sending all my love and wishes for a joyous and peaceful 2017. Actually, my niece Brenda made the gingerbread house in the photo. My family made a number them, all adorable. Wishing you a fabulous and peaceful 2017 as well, dear friend. Thank you for your words, which are both playful and affecting. This is a wonderful analogy for us to contemplate as we make our way into the new year. Happy days! Thank you, Stephani, I’m so glad the playfulness came through. Happy New Year to you, dear eloquent soul. Your words, “never, ever succumb to any emotional tornado or mental wrecking ball” strike powerfully home. It gives at least some of the responsibility to us, the home owner. And sitting beside a warm fire with the Master, sipping cocoa, swapping stories, laughing and making really bad jokes sounds like heaven in a house built of humility, patience and love. Thank you for continuing to share your artistic talent, painting scenes with your words that always inspire and motivate. Yes, Rudy, that does sound like bliss, and it can be real in any moment. This morning my waterline was broken due to actions of my neighbor, and as I’ve gone through the motions both legal and arranging to have it fixed I’ve said to myself many times, “This is just the gingerbread house.” Thus I have kept a smile on my face. What a miracle is the inner Path. Thank you for your kind response. Friends definitely help to keep the mansion standing. What a great mantra, “This is just the gingerbread house…” I applaud you for your patience and kind nature to a newly-incarnated human. She will one day appreciate you and long to be like you. She has a mountain in front of her that overwhelms her soul. I like how you recognize her infancy and tolerate her tantrums and know she is just growing up. Especially with broken water lines in mid-winter! Thank you for this, Rudy. You always remind me of the great kindness available to us in the now. “Sweet” reminder. Staying close to that hearth with the Beloved is the daily ongoing spiritual exercise that grounds us ever more strongly in The Presence. Coming home to a houseful of family yesterday after work, after 4 full days off celebrating the season, and reacting (not positively) to all the raucous made me realize how delicate still is my spiritual mansion and how strong my ego remains. I know what you mean, Sheila. The inner mansion is so strong and yet so delicate, like the stallion that our Beloved often references. I too have seen over the holidays how vigilant I must be in order to keep my mansion tidy. Thank you Lesley, this really speaks to me, especially at this time of year with all the ‘sweetness’ that Christmas can bring. I love the image of enjoying the sweetness and fun of our gingerbread house of life, yet staying centred in the warm glow of the Beloved’s love. It’s so true how vigilant we need to be to maintain humility, patience, contentment and balance in the face of ego’s willful ways….yet how consciously connecting to the warmth of His love for us can grace us these gifts and so strengthen our true selves. Thank you! Greetings Lesley! Your words…my attention…His inexhaustible Love! I so resonate with this ingenious poem..it has the same fragrance as the finest Hafiz! 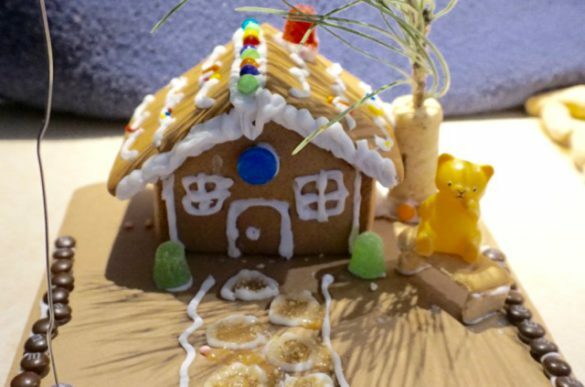 Well done and so very piquant, complete with discrimination/caution regarding the alluring but false “gingerbread house”, which not only detours attention but, if not careful, will absorb it. Thanks so very much and the happiest New Year to you and all loving contributors! Thank you, Al. It is so easy to be lured into the sweetness of the gingerbread house. Fortunately our wonderful Teacher helps us see the duality that lives there. Happy New Year to you, dear friend. Thank you for your inspiring comments through the years.